"Discover a place that defines a new dimension of relaxation and hospitality"
"Discover a place that defines a new dimension of relaxation and hospitality." Welcome to Filoxenia Studios & Apartments. In an area full of green, away from the city noise and just 1.5 km away from the heart of Zakynthos town, lies FILOXENIA Studios & Apartments. 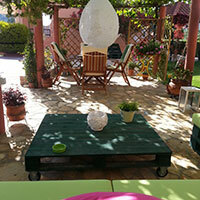 The ideal place, in the countryside, that will make your holiday exciting and your stay enjoyable. 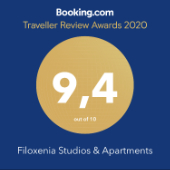 All the rooms and studios of FILOXENIA are spacious, refurbished and fully equipped, with beautiful colors on the walls and furnished balconies to enjoy the view of the lovely garden. They have air conditioning, TV, WIFI and kitchen facilities. FILOXENIA is a well-organized accommodation that will make you feel like your home. A really relaxing 10 day break with no fuss or hassle. 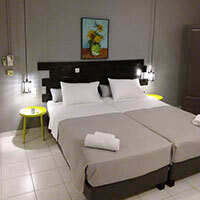 The rooms were lovely and cleaned every day, the hosts could not do enough for us, and the location is great for exploring Zante town or Argassi. Highly recommended. The couple running this hotel are absolutely amazing, so friendly and always making sure everything was ok, helping us with booking taxis and even laundry. The room was spacious and had everything we needed and more. I would definitely stay here again. The location of the accommodation is absolutely ideal. You are in a countryside but being close to everywhere. Just around the corner from the heart of the town of Zakynthos, a stone-throw from the airport (no noise) and about 3km from Kalamaki and its beach and about 6km from Laganas and its lovely beach. Follow us on the social media to stay in touch with us and keep an eye on our news.